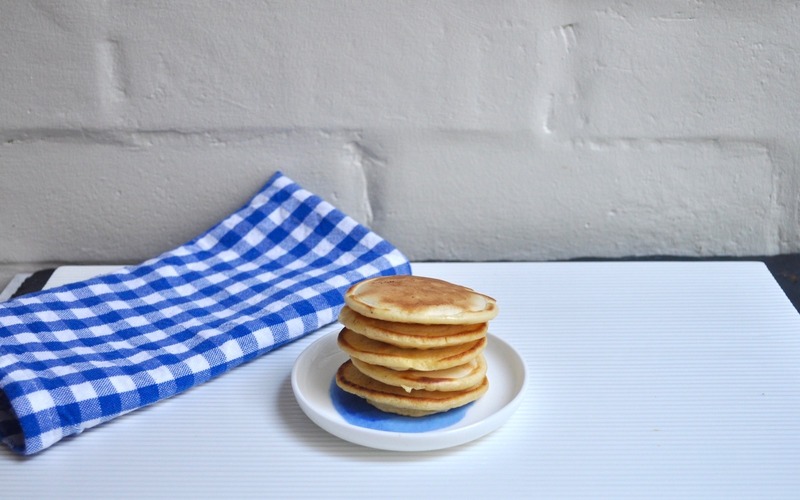 Drop scones – also known as scotch pancakes – are thick little pancakes, often spread with honey or jam. The smell of them cooking takes me back to my childhood, as my grandmother used to make them all the time, and then serve them warm, thickly spread with butter and homemade jam. This recipe is taken from her cookery book. Although the drop scones are nicer warm, Mini Jones also likes them cold, served with fruit puree and plain yogurt. Sieve flour and baking powder into a mixing bowl. Make a well in the centre and pour in the egg, beat with a balloon whisk, gradually adding the milk until you get a smooth batter that just drops off the spoon. Lightly grease a frying pan and place over a medium heat. Drop spoonfulls of the mixture into the pan, leaving room for them to spread slightly. Fry over medium heat for about 2 minutes until bubbles appear and they are golden underneath. Flip over and fry another 1-2 minutes. Cook in batches of 4-5. Wrap in greaseproof paper, then defrost and warm through as above.